It started with a celebration of head coach Sylvia Hatchell’s 1,000 career wins. It ended with a triumphant Paris Kea embracing a tearful Jamie Cherry. Everything that happened in between these two moments? Madness. Pure Carolina vs. Duke madness. From big deficits to even bigger shots, the 96th meeting between the Tar Heels (14-6, 4-3 ACC) and No. 15 Blue Devils (15-5, 4-3 ACC) offered 45 minutes of nonstop excitement and ended in UNC's favor, 92-86, for the first time since 2014. An early 19-point Duke lead eventually gave way to a stirring Tar Heel comeback; an unsung freshman came to the aid of Carolina’s two veteran stars; and the intense emotions after the final buzzer sounded led to Hatchell grabbing a microphone moments after the game. “That’s what you call heart right there," she said. Before any of this, of course, there was the pregame celebration of the 1,000 games Hatchell has won in her head coaching career. A banner in honor of her 1,000th win over Grambling State earlier this season unfurled in the rafters, Hatchell received a custom Carolina jersey reading “1000” across the back and Duke head coach Joanne McCallie gave Hatchell a $1,000 donation to the N.C. Cancer Hospital on behalf of her 1,000 victories. After a video broadcast — which featuring friends, coaches and former players each congratulating Hatchell on her accomplishment — Carmichael Arena was buzzing and more than ready for tip-off. Feeding off the crowd’s energy, both teams took off running from the opening tip. The frenetic pace led to many early shots, if not a lot of early makes. The Tar Heels shot just 27.8 percent in the first quarter, making just one of their seven three-point attempts, and Duke held a 20-11 lead after the opening period. The Blue Devils continued their commanding lead into the second quarter, which started with a nearly four-minute scoreless streak for UNC as the Blue Devils pushed the lead to 19 points. The game was on the verge of a blowout. But freshman Leah Church, who was averaging just over three points per game, started hitting the biggest shots of her young career. A transition jumper and a subsequent three by Church sparked a 13-2 run by North Carolina — punctuated by a buzzer-beating layup by Kea to end the half — to cut Duke's lead to eight at halftime. The run continued into the third quarter, when another three by Church cut the lead to one. Both teams traded baskets until a Cherry three again cut it to one as the quarter ended. Then, after 20 points in the first three quarters, Kea came alive. She scored 13 in the fourth quarter alone, including a three-pointer with 7:27 left to give the Tar Heels their first lead. After Duke responded with a 12-3 run to retake an eight-point advantage with 2:15 left, Kea rose over two Duke defenders for a jumper to cut it to six. Following another Duke basket, Kea dribbled baseline, pump-faked, jumped into her defender, drew the foul and still knocked down the jumper, turning her thumbs towards herself afterwards in celebration. After the free throw, the lead was down to five. Still, the Tar Heels found themselves down by six with only 30 seconds left, and Duke had seemingly wrapped up a victory. Cherry drew a foul on a three-point attempt, with 27 seconds left, but she missed the front end and could only cut the deficit to four. It looked like the Carolina comeback attempt had come up short. Duke inbounded the ball, up by two possessions and in control, only to have Kea snag one of her six steals and hit another tough mid-range jumper to bring the Tar Heels within two. An intentional foul sent Duke's Rebecca Greenwell — who dropped 30 points in Chapel Hill last year — to the line, but she missed the second attempt, one of Duke's eight misses on the day. So, on its next possession, Carolina took the ball out of bounds under its own basket with four seconds to go, down by three. Kea caught the ball beyond the arc, rose up over the Duke defender and let it fly. Kea was the hero who tied the game, but who had the play been drawn up for at the end of regulation? Church, the freshman who had never scored more than eight points in a game, yet had earned the trust of her Hall of Fame coach. Just like that, the 19-point deficit was irrelevant and the fans were treated to free basketball inside of a raucous Carmichael Arena. Kea’s three to tie the game seemed to open the floodgates, as the Tar Heels hit five of their six shots in overtime — including four of their five threes — to build an eight-point lead and eventually win by six. Two of those threes came courtesy of Church, who finished with a career-high 19 points and played with the confidence of a four-year veteran. Alongside Church, Kea and Cherry both had memorable games for the Tar Heels. 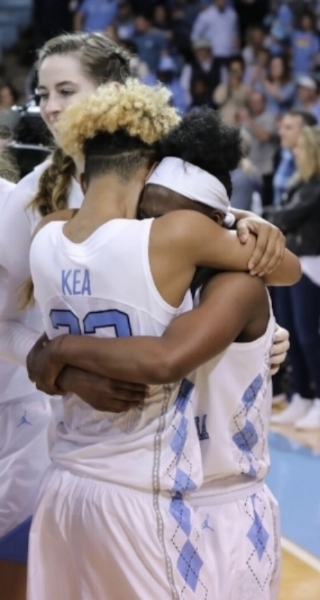 Cherry, the lone senior on the team, poured in 22 points and handed out 13 assists as she played Duke for the final time in Carmichael, breaking down into tears as the final buzzer sounded. And Kea, who scored a career-high 36 points and hit the biggest shot of the night, was left hugging her backcourt mate, surrounded by teammates and cheering fans, taking in the biggest win of the season. Long after the buzzer, the usually quiet Kea joined Hatchell and Church at the postgame press conference, smile drawn across her face as she fielded question after question about her big shot. And before it ended, she took one more at the Tar Heels' archrival. “Who doesn’t love beating Duke?" she said. On Sunday, they finally did. UNC women's basketball beat Clemson on Thursday, but it was almost a loss in Sylvia Hatchell's mind.